Sunanda Khajuria was born in Panthal, Jammu in 1979. She completed her B.F.A. (Painting) from the Institute of Music and Fine Art, Jammu in 2002, and did her M.F.A. (Painting) from the College of Art, New Delhi, in 2005. Subsequently she participated in an Advance Research Program at the China Academy of Fine Art, Hangzhou, China, where she also learnt the Chinese language and Chinese traditional art. She started her advanced research on Chinese Traditional Painting and Calligraphy at China Academy of Fine Art. She quickly engaged in international art residencies and projects from diverse countries including Australia, Italy, Russia and China. With her keen eye on emotional and psychological states of human nature, Khajuria draws inspiration from her experiences in these diverse locales that aid in her exploration of the possibilities of the visual language. Khajuria’s trajectory and artistic evolution have been nurtured by Art Heritage; her first solo show, World of Dreams was held in 2008; and she participated in group shows at the same gallery in 2007 (Cross Currents 2), 2010 (Seven Women Artists), and 2015. Khajuria’s earlier work, a culmination of her residencies and travels, reflect her movement through new cultural and geographic terrains. Her introspective series World of Dreams, delves deeply into personal memories, transforming them through her work, with herself as the protagonist or optical centre of the painting. In this series, she selects motifs from memory, infusing them with inferences from the present in an amalgamation of past and present, urban and rural, using an unorthodox, yet clever colour palette. Moving Landscapes, her most recent solo show held at Art Heritage, is the conclusion of her experiences with different times and places that she explored during her travels in Asian countries. With this work, Khajuria was deeply immersed in Chinese culture, tradition and language. This engagement was beneficial for her to understand her own investigations and ideas. Sunanda Khajuria has had several solo and group shows in India and abroad. Most recently, she participated in the prestigious Beijing Biennale in May 2015.Significant solo shows include “Airway to Heaven” Shangyuan Art Museum, Beijing (2014); “The Night Excursion” Museum of Contemporary Art, Hangzhou,(2012); “World of Dream” Art Heritage Gallery, New Delhi (2008). Selected group exhibitions include “Lost identity”, Shangyuan Art Museum, Beijing (2015); “Duet Show”, Indigo Blue Art Gallery, Singapore (2015); Group Show, Art Heritage Gallery, New Delhi (2015); “She Views Herself “ Curated by Doris Kloster, Paris, Beijing, New York and Geneva (2013); “Picture Wallah” Secher Cott Art Gallery and Auction House, Denmark (2010); “Seven Women Artists” Art Heritage Gallery, New Delhi (2010); “Joie de Vivre” Ganges Art Gallery, Kolkata (2009); and “Cross Currents -2”, Art Heritage Gallery, New Delhi (2007). Sunanda was awarded the 2007: Bundanon Residency Art Award, Australia in 2007 and “Woman and War” Red Cross Society Art Award, ICCR (2005). She has attended residencies at Shangyuan Art Museum, Beijing (2014-2015); Huan Tie Museum Art Residency, Beijing 2012); Red Gate Art Residency, Beijing, China (2009); W.H.A.T. Art Residency, Tanzania (2007); Bundanon Art Residency, Australia (2006). 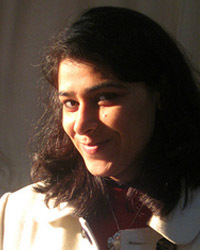 Her work was also showcased at the India Art Fair 2011-13.